a day in the life: "We are rich." I've been in something of a rut lately. After all the holiday knitting I've stalled. I have 3/4 of a sock knit and half a head for the last elephant I'll be making for a while, but that's it. Josh's sweater is basically done, just needing the zipper sewn in (but I'm without an operable sewing machine). I have so much yarn - and got more for Christmas, along with other knitty supplies - and so many things I do want to make, I just... don't want to knit right now. I want to cross stitch, but I don't have supplies for that currently so that's not an option. I've been reading a lot lately though. I've finished three books already this year, and am nearly done with the fourth. I have a few piles just waiting to be worked through, not to mention all the others on the shelves that just want to be read. I want to read them all *right now* but obviously can't. But I'm plugging away and enjoying it again. I'm also in a rut life-wise lately, not just with hobbies. I was at the DIA on January 2 to see a Faberge show (which was amazing - and of course I picked up a book on Faberge) and in the gift shop they had a book by someone I graduated high school with. This just depressed me. I knew she had it out there, but as long as it was just briefly mentioned on Facebook and her blog, safely at a distance through the computer screen, I could ignore it. But there it was, sitting there. One more thing looming over me, making me feel like a failure. I haven't written anything since I graduated last May, though I have ideas, and seeing her book was like a punch to the gut. I need to write again. Work on something again. Additionally, my sister is heading to California in the near future to do work at some sort of farm... I'm not exactly sure. And she's applied for a Fulbright to go to Iceland. And she just seems so much... better? than me that it stings. Josh keeps reminding me that I have things she doesn't have. And that I can write something out of some of the ideas I have, I just need to do it. He's helping me keep perspective on things a bit. Whenever I get down about what I've done or how to manage bills and necessities, he's there to keep me from going crazy with "what ifs" and worries. 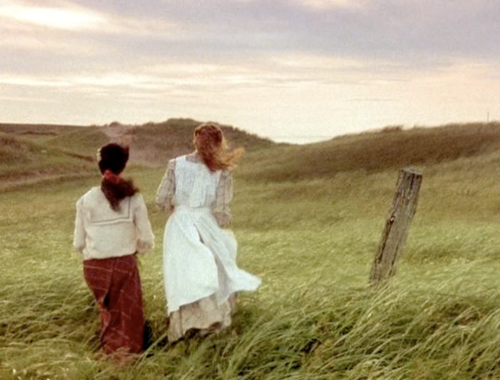 There's a scene in the Anne of Green Gables movie/mini from the 80s, after Anne has performed at the concert at White Sands, where she and Diana are looking out over the water at sunset. Anne: Look at that. You couldn't enjoy its loveliness more if you had ropes of diamonds. Diana: I don't know about that. I need to listen to Anne. I am rich. I have a wonderful husband and a crazy little cat. We have a home. I have a job, which in this economy is something to be grateful for. I have time and means for my hobbies and passions. I could drive myself crazy thinking about what I could have or could be, not appreciating what I do have. I'm incredibly lucky. "We are rich." We really are.